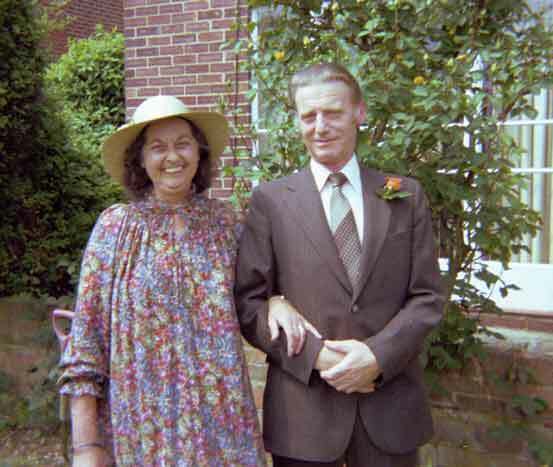 My mum and dad, in the back garden at 18 South View Road in Marlow during the summer of 1979. One of dad’s rose bushes is behind them: he never quite mastered the art of pruning, and the bushes grew into trees! Let’s start at the beginning, my beginning. That means Mum and Dad Stock, Cath (née Smith) and Jim. I was their first born, and then two years later along came Sue. There we were, the classic 1950s and 60s nuclear family! Mum and Dad Stock, Sue and me during our first Italian vacation near Venice, in July 1967. 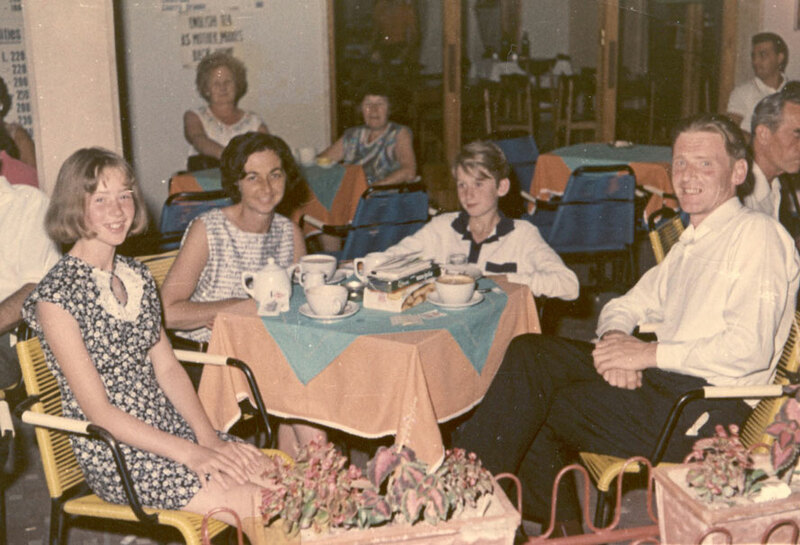 Mum had always wanted to take us visit Venice, and return to Venice Lido where she had been billeted during the war. Not a bad posting, you may note! We still were when the photo above of mum and dad was taken before a neighbor’s wedding in 1979. 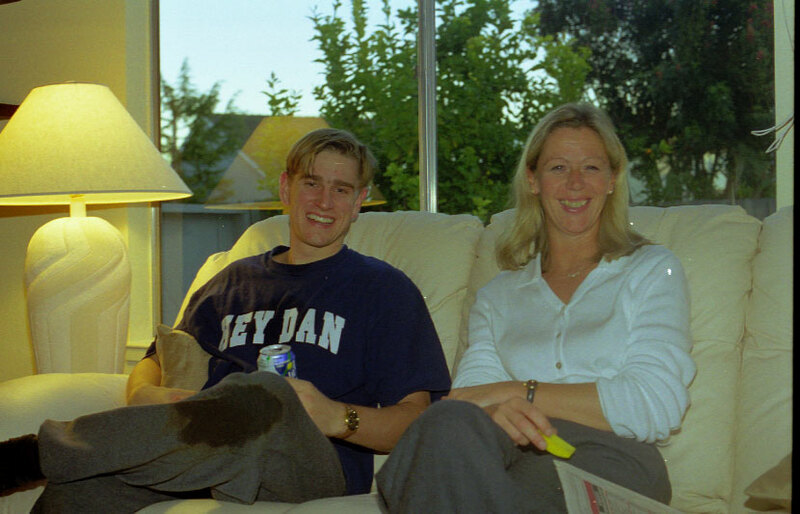 Sue had married Derek Nash in 1975, and their children, Antony and Laura, were both born in the 1970s. Both knew their maternal grandparents. They were the lucky ones. None of Marie-Hélène’s and my children knew Dad, who died at the age of 58 in 1983, and only the older children knew Mum all too briefly. Nick and Tom knew her from their respective births, in 1986 and 1989, but Marie-Hélène and I only moved in together in August 1994, and Daphné and Alban only knew her from then. Mum, by them known as “Missus,” was very ill for most of her last years, and finally passed away at the age of 69 in July 1996. On summer holiday again, this time in front of Loch Lomond in 1966. We walked up Ben Nevis, the highest mountain in the UK, or at least Sue and I walked up it while mum and dad waited on a blanket about half way up. Another day,we saw the Isle of Skye for the first time, and the sun shone almost the entire vacation. If you knew the UK climate, you’d know how special that sun was. I wrote my first memoir, called “If I Only Knew,” about our nuclear family’s years together, Cath and Jim, Sue and Ian. This second memoir (not the next in time, the next to be written) is obviously not the place to repeat it. Instead, this page covers the role of the Stocks and Nashes in our blended family. We’ve already established that my dad was no longer there, but he still made a major contribution to us. He and his company, Reed International, had left mum in great financial shape when he died before retirement, and she believed in helping her children out: that was quite a contribution, and a lesson about what it means to be a dad. It was no accident that mum was so well provided for. 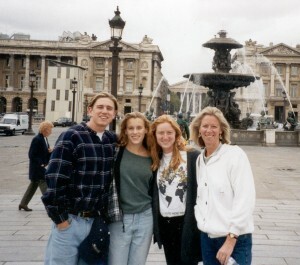 Antony, Courtney (not yet a Nash), Laura (now a McClarin) and Sue in Paris. The back of the photo said November 1994. Derek must have taken this one. She was our biggest supporter when we moved in together, and not just financially. There’s a whole page of this site about that. Her emotional support was particularly encouraging for Marie-Hélène: it was one of the things that brought her over to me, I think, a kind, maternal presence. She’d lost her own mother three years before, and that had left a big hole in her life. The Nashes were less present, because they lived at that time in Foster City, California, between San Francisco and Palo Alto on an island in San Francisco Bay. That’s why they were unable to attend our wedding. 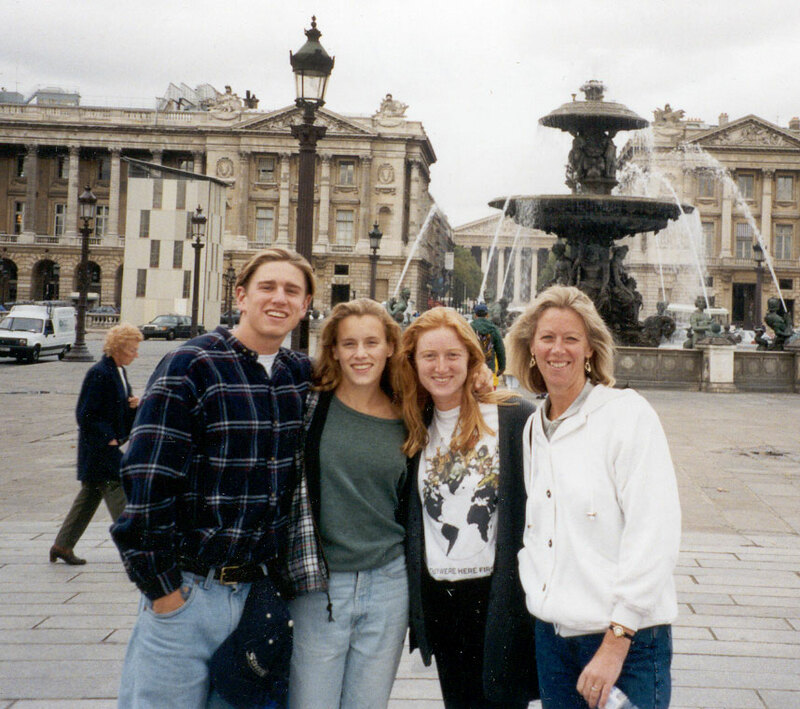 We didn’t all see them until after mum died, although I have a photo of a trip they made to Paris in 1994. Did we see them then? I don’t think so, and don’t remember why not. Marie-Hélène and I didn’t make it to California, even to visit, until early 1997, when we went to see if it might work for us all to leave France and live over there. Here we all are at a pub near Marlow in August 1996. It was not long after mum’s funeral. All seven of us (Alex was not yet born) are in the photo, with Laura, Sue and Derek Nash. Antony must have taken this one. Starting on the left, Daphné is next to Nick who is next to Laura. Then come Sue and Derek. Across the table finds Charlie on his mother’s lap, and then me, Alban and Tom. The Nashes were all at mum’s funeral, I think. How do you remember who was at your own mother’s funeral? I was 43 years old and completely gutted. The Nashes were very kind after we arrived in Santa Cruz. They were only an hour away, and so we saw them regularly, for a while. This was during our Christmas visit to their place in 1997. Sue was there, thankfully: she had been visiting mum’s house in Marlow from California when mum died at the BUPA hospital in Reading. That was July 24, and the funeral was July 30. Yep, I think that Derek and the children were in England by then. It was actually a bit lucky that Sue visited mum at that time. I had visited her the weekend before she died with Nick and Tom, but after taking them back to Paris on the Sunday could not get away from work to come back to Marlow. Mum was clearly very ill that last weekend, and looked at me as if through a tunnel. You can see the good news in this picture of the newlyweds (relatively!) on the roof of their home! It’s Charlie’s birthday in 2005, and Charlie, Alex, maman and I visited Courtney and Antony’s lovely home in Ocean Beach. Click to check out the view of the Pacific! Sue and mum had had issues in the latter’s later years, and in consequence mum had changed her Will: she went so far as to “disinherit” Sue in favor of Antony and Laura. I was opposed to this change during mum’s lifetime, because it seemed purely vindictive. Also pointless: leaving half to Sue’s children was the same to my mind as leaving half to Sue. As co-executor of her estate (mum’s financial adviser was co-executor), I was able to help fix this one. Antony and Laura didn’t want to see their mum mistreated, both wanting to take advantage of an odd provision of English law which allowed them to renounce their grandma’s bequest in favor of their mum. By this time, Antony was 21, and Laura 19, old enough to decide for themselves. At their request, my co-executor and I changed the Will back to where it had started, half to each of Sue and me. Everyone was happy, and to this day Sue’s numerous complaints about her big brother (her angelic big brother, I should add!) have included none about reworking mum’s Will. Antony has always been a great big cousin, partying with the older set and mentoring the younger. Here he is helping Alex learn mini golf during our 2005 visit. While all this bureaucracy was going on, the Stock Brun family was settling down in Santa Cruz, close to the Nashes, and we saw each other quite a bit for the first few years. They helped us a lot too, loaning us some furniture when ours didn’t arrive, and selling us our first car in the US, a Mazda 626, for a pittance. It ran over 100,000 miles in the ensuing six years before we finally sold it. All this help was much appreciated. Then over time we became more distant, at least from Sue and Derek. The whole Nash family moved to San Diego in 2002, after Antony graduated law school and moved down there to take his first job. As a result, they were all less easy to visit: San Diego and Santa Cruz are 400 plus miles apart. With one thing or another, things like new children for both Courtney and Antony, on the one hand, and Laura and Damian, on the other (all new grandchildren for Sue and Derek), and the grandparents moving back to England (I do feel old calling my sister a grandparent!) and beginning to spend most of the year there, our relationship with the Nashes turned almost completely into a relationship with Antony, Courtney and their children. With Tom at the rehearsal dinner for the wedding. And a very rewarding relationship it is too! They are both very busy with careers and as parents. Antony made partner in double quick time at his law firm, and no-one does that without a ton of work. Courtney first attended law school and graduated, and then took on a public interest job, which again no-one can do well without a ton of work. As I write this (in 2012), they have three children of their own, all little, and each energetic in his or her own way! In short, it’s that time in the life of a family when the parents feel just a little insane! 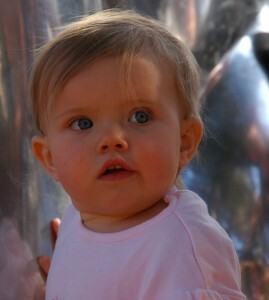 Avalon, Courtney and Antony’s oldest and the first Nash grandchild, in San Diego Zoo, 2007. But they still find the time for us, or groups of us, and when they do they are kind and concerned and warm with all our children. They party with the older, and are genuinely interested in their respective trials and tribulations, and they mentor the younger: when Charlie found out that Antony had been a runner in high school and still ran, he asked to run with him, and then asked for tips on the correct running style. Antony willing offered his expertise, and Charlie was delighted and never forgets his advice. Yeah, you guys! It’s always a pleasure!